CNBC-Stocks in Asia were mixed on Thursday following the release of Caixin PMI data from China, which was at an 11-month low, and as the yuan hit a seven-month high. The on-shore yuan traded at 6.7987 to the dollar at 3:00 p.m. HK/SIN. The dollar had traded as low as 6.7830 yuan earlier in the session, levels not seen since last November. Before markets opened in China, the People’s Bank of China set the yuan mid-point at 6.8090 to the dollar — its strongest level in seven months according to Reuters. China’s central bank lets the yuan spot rate rise or fall a maximum of 2 percent against the greenback, relative to the official fixing rate. In the offshore market, where the yuan is more freely traded, the currency fetched 6.7518 to the dollar. “While there remains some politics in play after the Moody’s downgrade … the stronger yuan could be in China’s best interest to promote yuan internationalization and attract more investment,” OANDA Senior Trader Stephen Innes said in a note. Japan’s benchmark Nikkei 225 index jumped 1.07 percent or 209.46 points to close at 19,860.03, while the Kospi reversed earlier gains to trade lower. 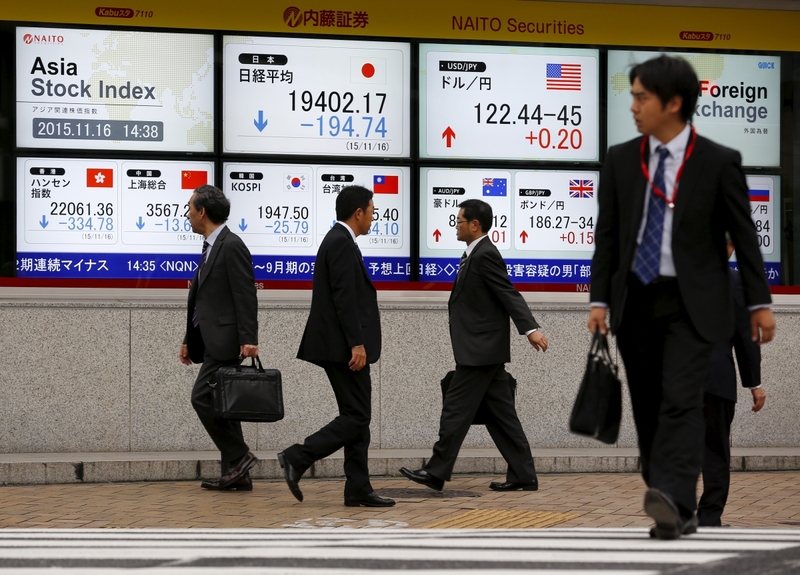 The Kospi closed the session down 0.12 percent or 2.77 points at 2,344.61. Down Under, the S&P/ASX 200 finished the session up 0.24 percent or 13.528 points at 5,738.1. Markets in greater China were mixed. The Hang Seng Index was higher by 0.49 percent at 3:05 p.m. HK/SIN. The Shanghai Composite closed lower by 0.5 percent or 15.4795 points at 3,101.6983 while the Shenzhen Composite fell 1.919 percent or 34.6956 points to finish the session at 1,773.6063. This followed the release of Caixin manufacturing PMI figures for China in the month of May. The data showed factory activity fell to an 11 month low, coming in at 49.6 compared to the 50.1 forecast. The Caixin PMI read weighed on the Australian dollar, which fetched as high as $0.7454 earlier on the back of domestic retail sales figures. The Aussie traded at $0.7407 at 2:45 p.m. HK/SIN. “Today’s data is a reminder of what is important for Australia — and it’s that a soft China overrides positive domestic data for Australia, as this feeds back into their own growth and inflationary projects,” ThinkMarkets Senior Market Analyst Matt Simpson said. The start of the new month will also bring with it a fair amount of risk for markets to navigate, IG Chief Market Strategist Chris Weston said in a note. “There will be a reasonable amount of event risk to work through, not just with U.K. elections (June 8), with the ramifications of that event seemingly contained to U.K. assets, but key central bank meetings from the European Central Bank (also June 8) and Federal Reserve (June 14),” Weston said, adding that he was also keeping a focus on “all things Trump” due to the correlation with the dollar. Meanwhile, annual economic growth figures in India slowed in the quarter ended March, coming in at 6.1 percent. The weaker than expected figures released yesterday reflected the lagged impact of demonetization, Goldman Sachs said in a note. Oil prices gained after falling 3 percent in the last session. U.S. crude jumped 1.1 percent to trade at $48.85 a barrel while Brent crude gained 1 percent at $51.27. Against a basket of six major currencies, the dollar ticked higher to trade at at 97.081. The dollar also gained against the yen. At 2:30 p.m. HK/SIN, the greenback fetched 111.02 yen, off lows around 110.65 seen in the overnight session. Meanwhile, the British pound edged lower to trade at $1.2844 after fetching as high as $1.2892 earlier in the session. The sterling slipped to a more than one-month low earlier this week.